Chambers Fine Art is pleased to announce the opening on March 14th of A Minimal Vision: Furniture with Paintings by Yun Gee. In this exhibition there is a dialogue between Chinese furniture of the Ming (1369-1644) and Qing (1644-1911) dynasties and the remarkable paintings of Yun Gee (1906-1963). In recent years knowledge of the full range of Chinese furniture has grown enormously. Research into regional variations and vernacular styles has revealed a wealth of material hitherto barely known outside China and not seriously regarded even in the country of its birth. The emphasis in the current exhibition is on Chinese furniture at its most unadorned, notable for the clarity of its forms and structure. Nothing could be more elegant than the 17th century bookshelf in which the relationship between the four supporting columns and the four rectangular panels is left completely exposed. For those whose taste has been formed by the minimalist aesthetic of so much contemporary art and architecture, the bold forms of the tables, chairs, benches and cabinets will have a particular appeal. Yun Gee was born in Guangdong province in 1906 but left China in 1921 to join his father in San Francisco. As described by Robert E. Harrist, Jr., he was “a restlessly inventive painter, sculptor, poet, and performer (who) held one-man shows in San Francisco, exhibited in Paris galleries, and gave classes in “new Cubism” in his Greenwich Village apartment – all before reaching the age of thirty.” Notable for their intuitive understanding of the Cubist idiom and for their brilliant coloration, the works in the exhibition were painted between 1926 and 1933 in San Francisco, Paris and New York. Included are self-portraits, figure-studies and three studies for the “Last Supper.” This is the first exhibition in New York of Yun Gee’s work since 1983. Every year in March, in order to accompany the Asian Art Fair in New York, Chambers Fine Art always curates the significant exhibition of the year. In this coming March 14, the Gallery will have the exhibition A Minimal Vision: Chinese Intellectual Furniture and Specially Selected Paintings by Yun Gee. 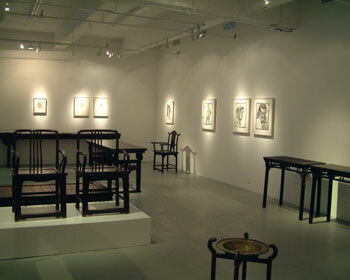 This two-theme exhibition includes Chinese antique art and contemporary art. Since the Chambers Fine Art has been focusing on Chinese art as their primary concern, the Gallery stands out among galleries in New York. Thanks to the special resources and advantage possessed by the Chambers Fine Art, the Gallery is able to have two themes in this group show, Chinese Intellectual Furniture and American born Chinese artist Yun Gee. Two partners of the Gallery have excellent background: Jerry Chen is a professional consultant of Chinese antique art, and Chris Mao specializes in modern art. Therefore, for western collectors, this exhibition is creative in both aspects of the curatorial theme and exhibits. Chris Mao points out that in order to better understand how western people look at Chinese oil paintings and their taste, the Gallery invited four famous western gallery owners to participate in the selection of Yun Gee exhibits. So that from this exhibition, we could see how western eyes see the style of Chinese oil paintings. The reason why the Gallery chose Yun Gee as one of the curatorial themes is that they are concerned about intellectual and space. As we all know that Yun Gee left China for the States at the age of 15. We could say that Yun Gee was the first artist who was highly appreciated in a foreign country. In his work, he used a lot of elements and philosophy to express his thought, such as in “Confucius”, “ How I saw myself in a dream”, and others. They present Chinese spirits. 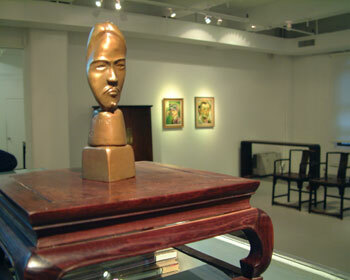 The Yun Gee works to be shown in the exhibition are primarily the early good works during 1920s and 1930s. Besides, the theme of this exhibition will be “portraits.” The Gallery plans to exhibit his 12 portraits that were significant in his own art career, for example: “ Where is my mother?” “My conception of Christ,” “Woman portrait with necklace” and few bronze sculpture of figures. Nonetheless, some of the works are for museums only and the private collectors who will be willing to donate to museums. They are not for sale for general collectors. The exhibition of intellectual furniture at the Chambers Fine Art will primarily have Chinese northern soft wood furniture as last year. 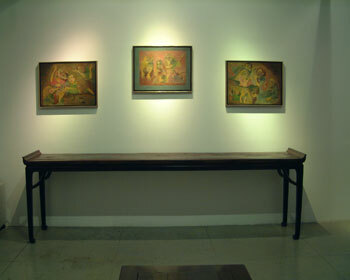 The Gallery selects mostly the furniture categories with special forms and with strong intellectual atmosphere. The Gallery publishes exhibition catalogues in every March for the Chinese Furniture Exhibition, and even has been regarded as the dealer who has Chinese antique furniture of the most high quality and quantity. As to the exhibition space, since Chinese intellectual furniture is all three-dimensional, lack of flat elements, this time the Gallery combines with Yun Gee works as a two-theme exhibition. In so doing, the Chinese antique art can be gently mixed with modern works, and western collectors can feel the abundant results of Chinese intellectual and different elements.